This year all the spring flowers are magnificant due, I suppose, to the very wet, mild winter and lack of severe frosts knocking things back. Some of the loveliest spring bulbs are Fritillaries. Ours are growing in a patch close to the rockery and pond which has a rather old and holey plastic membrane with gravel and stones covering it. The name Fritillary comes from the Latin term for a dice-box (fritillus) after the checkered pattern of the flowers. We have various colours: purple with cream and the reverse, and some creamy white with very pale mauve markings. 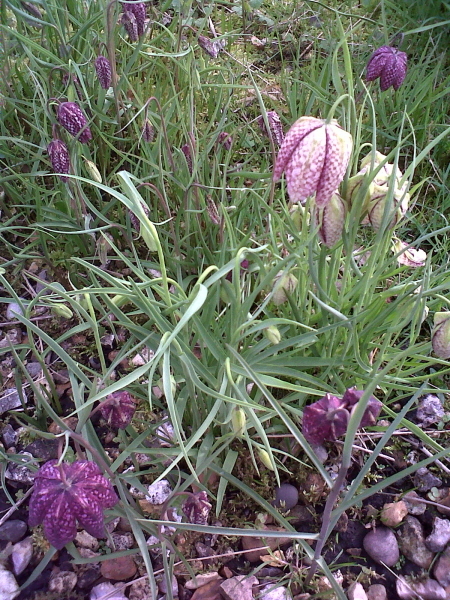 The Wikipedia entry for fritillaria shows other colours and patterns. 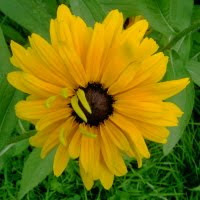 They always seem rather special but actually are very easy to grow and if you leave the flower heads to set seed they will increase by self-sowing. Make sure over-zealous weeders don't mistake the young leaves for couch grass and pull them up. The first Fritillaries I saw were on the banks of the River Anker in Tamworth Castle Grounds and had obviously arrived there by wind or on swan's or other bird's feet.